Rod Howat said a few words at the brief ceremony and recalled Frazer's contribution to motor sport. He also provided a wee bit of insight into the man, part of which highlighted: "Here at Doune, his authority was unable or at least unlikely to be questioned and whether competing or marshalling, you knew when Frazer was on a mission for whatever reason. Woe betide if you were on the track, perhaps sweeping, when Frazer took off up the hill to investigate an incident. I always thought that company cars were better than private ones in terms of outright top speed, acceleration from a standing start and precision handling and that certainly was proved in the case of the cars which Frazer muscled up and down this narrow track." Amen to that. Frazer joined the Scottish Motorsport Marshals Club the year after it was founded in 1973 and became an integral part of the leading team right up until he started to take more of a back seat in 2009. The sport was very different then. Prior to the creation of SMMC, such training as there was consisted of 'being shown what to do' and then left to get on with it. Frazer was one of those far-sighted folk who realised that the sport, and those who participated in it deserved better, especially when things went wrong, as can sometimes happen in motor racing and rallying. 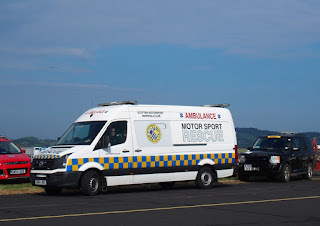 His interest in safety matters and Marshals training was bolstered by his experiences of being Clerk of the Course at some of the Lothian CC organised speed events at Doune in the early days and he was instrumental in SMMC acquiring and equipping their first motor sport ambulance. Oddly enough, I was reminded of that when I attended (unofficially - I was just being nosey!) a recent MSA 'Safety Car Workshop' training event at Knockhill. Organised in association with Rupert Hine, the SAMSC (Scottish Association of Motor Sports Clubs)Training Co-ordinator, the day long session was hosted by MSA Trainers Alan Page and Neil Fuller. Most encouragingly, the event was attended by 42 delegates representing clubs and events right across Scotland. As part of the registration process, the delegates were asked how long they each had been involved in motor sport. The result was a rather surprising 1403 years in total. I say surprising because given the age of some of the folk in that room I thought it would be much higher! On the other hand there were a reassuring number of 'younger' folks, a much needed resource these days as regulations become ever tighter and workloads greater. A full day of advice and guidance was offered from both sides, with discussion and debate undertaken, and was held in a most convivial and constructive atmosphere. This was no teacher/student learning experience because given the experience that was already assembled in that room, there were lessons to be learned by all. Given the demands being heaped on rally organisers and their officials these days, such training is necessary and vital to the future of our sport, as ever more volunteers are needed. At the present time there are just short of 400 licensed safety crew members and almost 10,000 registered Marshals in the UK. So if you want to get involved, get on to the MSA website or contact your local car club. Page & Fuller may not quite be the Morecambe & Wise of serious safety matters, and they might not have the snappiest catch-phrase, but they get the message across - if you are an Official on rally duty, then the message is: "See it, sort it."